Barefoot is currently offering a free ‘New Term Survival Guide’ to teachers who request a workshop before October 31st, and have it delivered before December 31st. The Survival Guide provides great tools to help teachers get started, including FAQs, top tips, a quick reference guide, five hand-picked resources and Barefoot goodies. 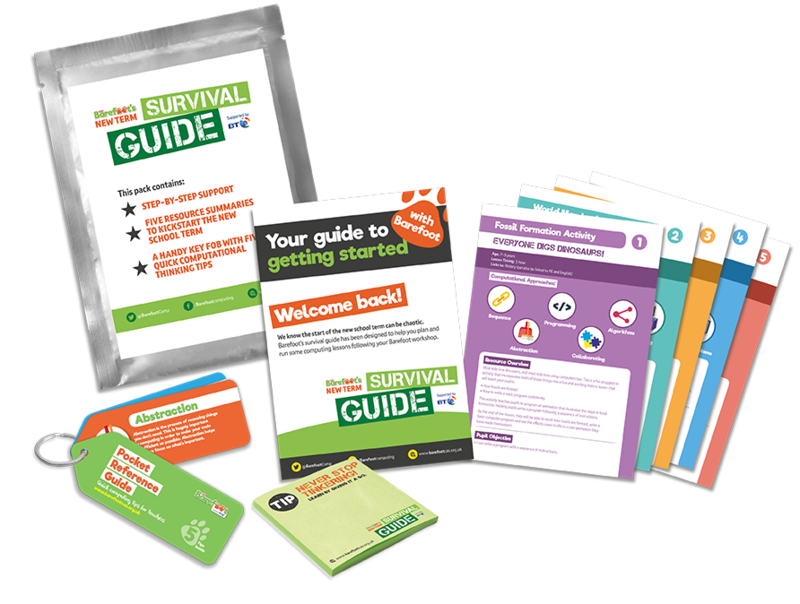 Teachers will receive a survival guide with their workshop packs and can claim one by booking a workshop on www.barefootcas.org,uk and use the campaign code ‘007’. The fantastic double act of Dash and Dot have now arrived . Those schools that have attended the CS twilights over the last few weeks keep a look out for them arriving in the school mail. Using School iPads Dash and Dot can be programmed via a number of free apps including Tickle, Wonder Workshop and Tynker. These robots are perfectly at home in Nursery / Early Years but because of the innovative design can be equally at home and challenging for older students to program.